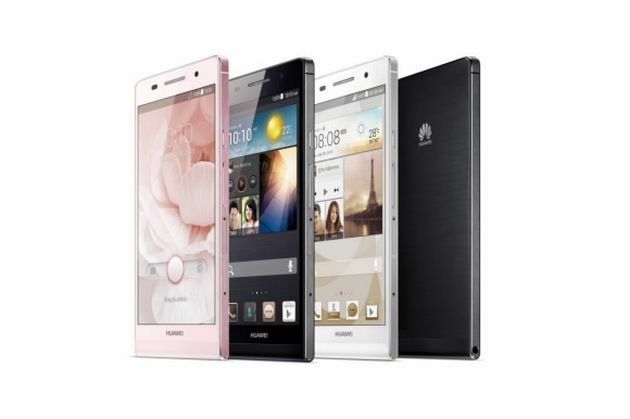 The Huawei Ascend P6 is the world's slimmest smartphone at only 6.18mm thick and will go on sale in 19 countries (UK included) by the end of July, the company has revealed today. More importantly, Huawei is pricing the 4.7-inch Android handset at a SIM-freeRRP of only €449 (roughly £380) which makes it cheaper than the Samsung Galaxy S4, HTC Oneand Apple's iPhone5 - all handsets that Huawei is planning to compete with. If you don't want to pay up front, the Ascend P6 will be available on contracts with all the major networks on price plans starting around £25 a month. Huawei's CEO Richard Yu was at the launch event in London today to officially unveil the phone,which will come in a choice of black, white or pink. "We want to challenge the market, challengeourselves, and challenge the innovation of the industry," he said. Encased inside the 6.18mmchassis is a quad-core Cortex A9 processor and 2GB of RAM. Primary features on the AscendP6 include a rear-facing 8MP camera, 720p 4.7-inch screen, 8GB of memory upgradeable viamicroSD and a 2000mAh battery. Huawei has overlayed Android 4.2.2Jelly Beanwith its own Emotion UI that features a central "Me" widget that collectsyour most valued information in one place. The Ascend P6 was given plenty of support from Sir Charles Dunstone, chairman of the Carphone Warehouse Group, whowas also present at the launch. "This companyis absolutely competing at the top level," he said. "Huawei is going to be a very big player in the smartphone market for many years to come." The Ascend P6 is available from today in China and once Europe and Australia have received the handset in July, the company said it would begin rolling out to a total of 100 global markets during August 2013.